The USS John C. Stennis (CVN-74) keel was laid at Newport News Ship Building and Dry Dock Co., in Newport News, Virginia on 13 March 1991. Three years and eight months later, to the day, on 13 November 1993, she was launched. Mrs. Margaret Stennis-Womble was the CVN-74s sponsor. On 9 December 1995, CVN-74 was commissioned USS John C. Stennis, the seventh of ten Nimitz class nuclear aircraft carriers. USS John C. Stennis was named for John C. Stennis (1901 - 1995), a senator from Mississippi for more than 41 years. Senator Stennis, as Armed Services committee (1969 - 1980) became know as "Father of Americas Modern Navy". After two years of shake down, training and flight deck certifications, USS John C. Stennis sailed from Norfolk, Virgina in February, 1998, bound for the Persian gulf, by way of the Suez Canal. After five months of operations in support of Operation Southern Watch, Stennis steamed for the United States and her new home port of San Diego, California. As she made her way eastward, she crossed the Equator south of the Island of Ceylon. After liberty call in Perth, Western Australia, Stennis sailed south of the continent of Australia calling on Hobart, Tasmania. The USS John C. Stennis (CVN-74) arrived in San Diego on 26 August 1998. After a six month planned post-deployment maintance period, USS Stennis returned to the cycle of shakedown, training and maintenance in anticipation of her next "watch" in the Indian Ocean. During this period she ran aground in November 1999 in the San Diego harbor turning basin. With her sea water inter-coolers fouled, she was forced to shut down both her nuclear reactors. The post grounding cleanup costs were estimated at $2,000,000. USS John C. Stennis deployed in January 2000, traveling across the Pacific and Indian Oceans once again, entering the Persian Gulf on February 28. Ending her support of Operation Southern Watch on 24 May, USS John C. Stennis repeated her path of 1998, southeast across the Indian Ocean, King Neptune purged the ship of pollywogs on May 29, then port calls in Perth and Hobart, Australia, before arriving home in San Diego on 3 July 2000. On September 10, 2001, USS Stennis heard the sound of "THIS IS NOT A DRILL, MAN OVER BOARD". Fortunately the sailor was recovered by helicopter and flown to the Naval Medical Center in San Diego. The next day, the World Trade Center bombing took place and Stennis provided continuous air patrols over Southern California until the threat was ascertained. 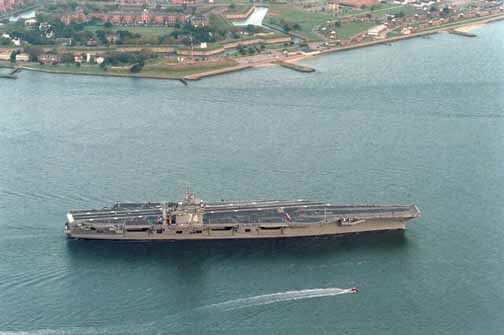 Later in September 2001, Stennis was informed that her next deployment was being expedited by two months. Instead of getting underway after the 2001 Holidays, she departed again for the Persian Gulf on November 12. After five months in support of Operation Enduring Freedom, she returned by the familiar track of the Equator, Perth, Hobarth, an addition port call in Melbourne, Australia, then on to Pearl Harbor and San Diego on 28 May 2002. USS John C. Stennis sailed 24 May 2004 for her first deployment that did not include combat operations in the Persian Gulf. Steaming northward to Alaska, then to Hawaii, she participated RIMPAC, a joint exercise by the Pacific Rim Allies to coordinate Air, Land and Sea forces. Stennis next crossed the Pacific, conducted operations with the forward deployed USS Kitty Hawk (CV-63), and then a series of port visits in the Far East, before returning to San Diego on 1 November 2004. The new year had Stennis steaming north along the West Coast to her new home port of Bremerton, Washington, arriving on 19 January 2005. Stennis then spent the balance of 2005 in the shipyard, including her first dry docking. The post ship yard work up and training cycle consumed 2006. In January 2007, USS Stennis departed for her fifth extended deployment. Returning to the Persian Gulf area, Stennis and her Strike Group of USS Antietam (CG 54), USS O Kane (DDG 77), USS Preble (DDG 88) and the group's underway replenishment ship USNS Bridge (T-AOE 10), joined the USS Dwight D. Eisenhower Strike Group for combined operations. After an eight month deployment USS Stennis returned to Bremerton, WA in August 2007. USS John C. Stennis was again dry docked from September 2007 to February 2008. April 2008 had her employed with the underway training and sorting required to "square away" after a yard period and prepare for up an upcoming deployment. Flight operations recommenced in May and on June 6th, Senator and Astronaut John Glenn visited Stennis. January 2009 brought her sixth major deployment. She crossed the Pacific, and as the deployment progressed, put into Singapore on April 24. That day, an Aviation Boatswain's Mate 3rd Class was killed while working on the ship's catapults. USS Stennis continued on with her duties, operating in the Persian Gulf, then working her way towards home with operations in the East China Sea and the Gulf of Alaska before returning to Bremerton on 29 June 2009.